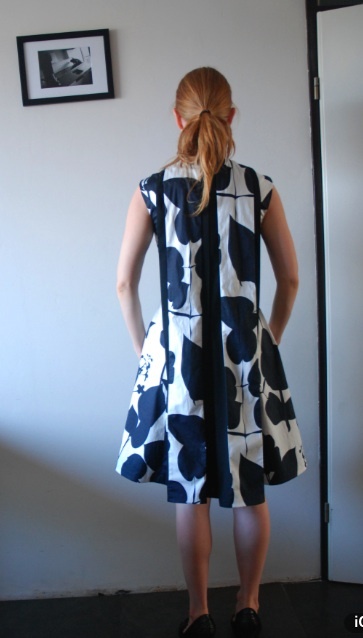 Aicha Hockx sent me these pictures ages and ages ago, of this amazingly gorgeous modern dress she made that features a Watteau pleat at the back. You *must* go check out her blog to see the posts she wrote about this dress: this one with more pictures (including the front, which has pockets! ), this one with historical references, and this one where she explains it all very clearly! This would quite possibly the world's best cocktail dress if executed in gold brocade. Actually, if you showed me this in gold brocade I would not be surprised if you also said "Look, it's Prada." That was indeed teh awesum. *applauds* What a great marriage of styles! Fabulous marriage of fabric and design. Ooops, I copied banis word choice of marriage. I guess I am not as original as I thought.Damnit. Id also like to put in a my hat for one of these in gold brocade! Perfect sophisticated party frock. Ooooh, the side view! I didnt really get the effect until I clicked and took a look. Am I crazy or would this be great in a bridal gown? Instead of a train, you know? I love this. To my eyes, this would be the thing to wear to work in an art gallery. Crisp, tailored, creative, and incorporating allusions to art history. And, in 2039, all art will officially be hung skew-haltered! I did a double take, because the hair and back of head looks just like my daughters. Neat dress.